That’s right, I put the whole alphabet (upper and lowercase) do-a-dot pages in one nice download! Previously they were separated out in my preschool alphabet activities by letter, so you had to download one at a time…pain I know. 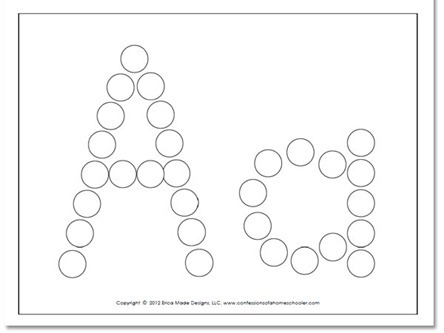 Here is a close-up of one of the pages, each one has both the uppercase and lowercase letters for your students to do. 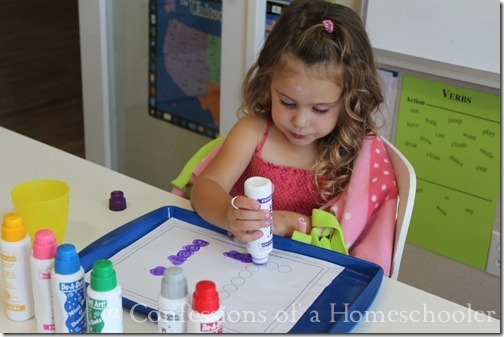 Don’t know what “do-a-dot” worksheets are? I’ll let the Teeny Tot show you. 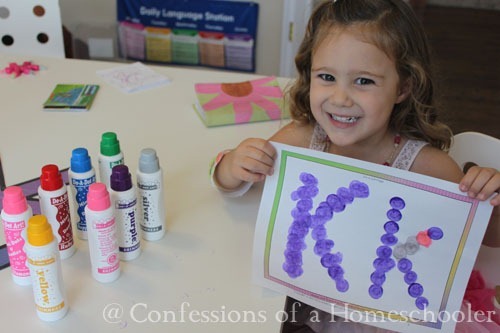 We use these pages with very fun and colorful Do-A-Dot Markers. The pages are great for working on hand-eye coordination, fine-motor skills, and one-to-one correspondence skills. Plus they’re just super fun! You can dot them all then add them to a 3-ring binder so your student has a colorful handmade alphabet book to review later as well! Magnets: You can even use them with button magnets on a cookie sheet! Paint: Have students paint each circle. Thank-you for the worksheets!!! We bought bingo dobbers at the dollar store and haven’t used them in a long time. I am excited to do one of these every day now. Oh my! You rock! Thank you SO much for doing this – I have VERY SLOWLY been making my way through your site trying to find them all! Seriously! Can you also make a file for all the letter tracing . Thank you! You are truly a blessing. This is exactly what we needed! Thank you so much for doing this. That is so kind of you. Amazing. genius. thank you over and over for putting them in one download. I like the idea of a binder too! !